Faced with mass defections from the Catholic Church after the clerical abuse scandal broke, Benedict XVI tightened up the rules. Then in 2010 he changed canon law to remove the possibility of defection. And national bishops' conferences restrict the notation on baptismal registers of even the wish to defect. Here are church-leaving rules (as of 2011) for Austria, Belgium, Britain, Denmark, Finland, France, Germany, Iceland, Ireland, Italy, Netherlands, Poland, Spain, Sweden and Switzerland. Many of the desperate Irish immigrants fleeing the mid-19th-century potato famine landed in Boston and stayed there. This made Boston a stronghold of Catholicism and even at the turn of the 21st century Cardinal Bernard Francis Law, Archbishop of the Diocese of Boston, was a very powerful figure. Then, in 2002 he faced an unprecedented challenge. The Boston Globe conducted an investigation, using Church documents, official testimony, and victim interviews, and at the beginning of the year began publishing the results. These showed how Cardinal Law and his administration had coddled abusive priests and permitted them to molest again, while stonewalling or paying off their victims. 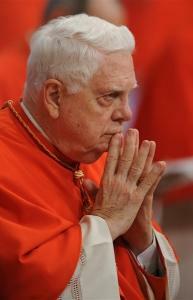 By the end of the year the Cardinal had been forced to resign and departed for the Vatican. But there, to the distress of the victims and other disillusioned Catholics, he was put in charge of one of the four major basilicas in Christendom, and housed in a palatial apartment adorned with frescoes. By that time the Boston archdiocese was facing a bill of $85 million in compensation claims from the hundreds of victims. This was only the beginning. Similar clerical crimes and coverups were soon reported across the US and abroad. Many of the faithful were horrified and did not want their contributions to pay for Church misdeeds. This set off a wave of Church-leaving, which the Vatican calls “defection” or “apostasy”. Not the least of the Vatican's problems was that this, in turn, reduced Church income. Something had to be done to discourage this. 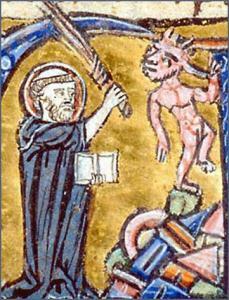 St. Augustine drives the Devil out of schismatics. So long as the Church controlled society, most church-leaving was done in the safety of a group, through schism. Today the exodus is largely by individuals, as apostasy. Unlike a heretic who has doubts, or a schismatic who launches a rival religion, an apostate wants out. Canon 751 — Heresy is the obstinate denial or obstinate doubt after the reception of baptism of some truth which is to be believed by divine and Catholic faith; apostasy is the total repudiation of the Christian faith; schism is the refusal of submission to the Supreme Pontiff or of communion with the members of the Church subject to him. ♦ The first attempt to deal with the new situation of people wanting to leave the Church en masse came in 2006 when Benedict XVI sent a etter to bishops on “The formal act of defection from the Catholic Church”, (Actus formalis defectionis ab Ecclesia catholica). This was a theological challenge to the state's practice of allowing anyone to leave the Church at will. The Church insisted that there must be a "reception of that decision [to leave the Church] by the competent ecclesiastical authority". One couldn't do it merely by filling out the appropriate government forms. Only the Church could decide who might “defect”. And, of course, in countries where Church membership has no tax implications, the state has no civil rules for leaving the Church, giving the Church a free hand to set the conditions for getting out. ♦ And finally, attempts have also been made to stem the exodus at the national level — of course, with the approval of the Vatican. Although “Catholic” means “universal”, the requirements for officially leaving this church differ from one country to another. The road is smoother where the Church has had to face legal challenges (as in Italy) and where the state offers an easy administrative process (as in Germany) because it keeps its own records of church membership in order to collect “church tax”. However, where the Church controls all the records and it finds itself largely unchallenged, (as in Poland) the bishops can lay down onerous requirements to leave. Church-leaving in Poland threatens the traditional predominence of the Catholic Church there, and the defections in Germany erode the “church tax” which brings the Catholic Church some 5 billion euros a year. (See Polish Bishops set rules for leaving the Church (2008) and German “church tax”: Court confirms the bishops’ “pay to pray” decree (2012).) In both countries the national bishops' conferences issued special rules governing church leaving. First the Polish bishops (2008-09-27) and then the German ones (2012-09-20) proclaimed that those who have de-registered themselves are to be denied any sacrament except final absolution. Canon 849 — Baptism is “the gateway to the sacraments and necessary for salvation”. Through baptism people are “freed from sin ... and, configured to Christ by an indelible character, are incorporated into the Church”. However, Msgr. Read's denial of this is firmly in line with Catholic theology. “The Catholic Church considers everyone who is baptised its member. These people do not have to claim they belong to the Church in a census,” says Jiri Gracky, from the Czech Catholic Bishops' Conference . At least from a theological point of view, the Church does not recognise the state's census figures, even though they better reflect what people actually believe. Its own Church laws allow it to keep on inflating membership statistics by counting everyone who's been baptised. The Dublin Archdiocese denies this, but provides no proof. Similar claims by the Church of England have been found to be untrue. For, according to Catholic doctrine, undoing a baptism is simply not possible. Any attempt to have the record of the baptism removed runs up against the brick wall of Canon 849 which asserts that baptism is “indelible”. Anyone who has been baptised remains bound by canon law and so, theologically speaking, is not able to leave the Church. Even those who left when formal defection was still possible were considered to have only excommunicated themselves, but to have remained Catholics, nevertheless. Like Islam, Catholicism considers renouncing the faith to be a “sin” and those who wish to leave are seen as violating the Church laws that still bind them. As a Slovak discovered, it's no use invoking any secular laws about freedom of religion: the Church regulates this according to its own laws. The best that can be achieved is a notation appended to the baptismal record. However, even this is being challenged in Spain. There the legal issue has become whether the European Union's data protection laws (1995, amended 2003) indeed apply to Church records. It’s worth over €5 billion annually for the German bishops to exclude anyone who doesn’t pay “church tax”. However, a devout retired professor of Church law went to court, claiming the right to take part in Communion and have a Catholic burial, believing that his church was more than a “public corporation under German law”. Just before the final court verdict, the bishops issued Vatican-approved rules denying that there was no right to these sacraments, and within a week the German court fell into line. You can leave the church by appearing at a government office with the required documents in both Germany and Austria, but in Switzerland you are forced to go to the parish office. Germany collects “church tax” through your income tax and you should retain proof that you have left the German church, or you could still have to pay. In France, Belgium and the Netherlands church membership is a private matter with no tax implications. EU directives on personal information oblige the church to make a note of the wishes of anyone who would like to leave. A court has ruled that under the French privacy law one has the right to have one's name deleted from the baptismal record, but a Catholic bishop has launched an appeal. Poland does not have church tax and so the matter of whether or not one wishes to be counted as a Catholic is of little practical significance. However, for many Poles it is still of symbolic importance. Until the possibility of defecting was abolished in 2010, the bishops laid out strict rules for permitting the baptised to excommunicate themselves. In Italy there is no tax based on church membership, but rather a voluntary direction of 0.8% (otto per mille) of one's income tax to either the religious organisation of one's choice or else to cultural intitiatives of the state. Thus formal church membership has no tax implications and it is not recorded by the state. However, the state has become involved in obliging the Church to record people's wish to leave it. Spain has a church tax, however, it is voluntary and does not depend upon church membership. This makes church-leaving in Spain a purely religions, rather than a political act. Furthermore, Spain's Information Protection Law does not apply to baptismal records, thus making it impossible to officially register the desire to leave the Church.